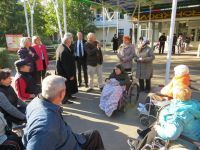 On October 12, 2015, UN Resident Coordinator and UNDP Resident Representative in Ukraine Neal Walker and UNDP Country Director in Ukraine Janthomas Hiemstra personally visited the sanatorium “Slovyanskyi” in Donetsk region. 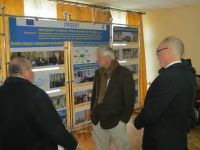 The third floor of the orthopedic building of this sanatorium was renovated with the support of the joint EU/UNDP “Community Based Approach to Local Development” (CBA) Project. Internally displaced persons (IDPs) with special needs found a temporary shelter in this building. The Heads of the UNDP visited the renovated building and familiarized with the results of micro-project, which aimed to create favorable living conditions for IDPs. “While visiting the health resort in Slavyansk for the second time, we have seen the successes and achievements of the CBA Project. We also met medical personnel who provide full support to IDPs and help them in job search. In general, we are impressed by the members of our team, who presently works in eastern Ukraine. Our staff quickly responds to nowadays challenges and set themselves the ambitious plans in order to contribute fully to the development and recovery of Donbass,” said Mr. Walker during the visit. The UNDP Ukraine delegation visited the sanatorium, which was renovated with the help of the joint EU/UNDP CBA Project, as a part of their official visit to Donetsk and Lugansk regions to discuss further cooperation of regional authorities and international organizations on issues of humanitarian aid and infrastructure rehabilitation in the region. Neal Walker also communicated with the Regional Coordinators of the CBA Project in Kramatorsk and Severodonetsk about the future work plans in order to meet the needs of people in the best way in the current situation. “Our heart is with the restoration and development of areas in the region. We will continue doing everything we can to help people,” emphasized Mr. Walker.